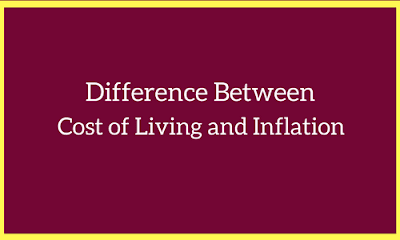 Cost of living and inflation are the terminology which always makes people confused. Both this term are somewhat similar in nature but differ in economic conditions. Cost of living refers to the cost of maintaining a standard of living (it includes food, transportation, housing, healthcare, comfort level, material wealth, needs etc.). This all are primary measurement tools of economic prosperity in a country and it will change from time to time. There are two types of tools used to measure the cost of living. Cost of living index is used to measure the relative cost of living from time to time within the country. It was first published in 1968. It considers the price of goods and services and allows substitute with other items. Cost of living index is calculated by taking into consideration of another region’s cost of living as a base. This is another method to measure the standard of living. In purchasing power parity, it uses the differences in currencies. It is an economic theory which measures the exchange rate between two currencies to the ratio of currencies’ respective purchasing power. The relative cost of living differs among countries who use different currencies. This is a complex method of calculating cost of living. Inflation means an increase in the price of goods and services in an economy. Inflation is a big picture as compared to cost of living. Price inflation means a rise in the consumer goods. Red inflation means a loss in purchasing power parity. The effect of both this inflation is same. The Bureau of Statics measures inflation by the consumer price index. Consumer price index measures an average of a basket of goods, it includes food, medical care, transportation and many other. CPI is used to measure inflation. Meaning Cost of living index is used to measure the relative cost of living from time to time within the country. Inflation means an increase in the price of goods and services in an economy. Effect It affects to the mobility of resources. It is a macroeconomic condition and affects the whole economy. It is calculated for city, state, country or region. It is calculated for each country.